Haven't made a Bleach wall recently, so heres to all the Bleach fans out there. Its the basic anime wall with a hint of my abstract effects and bright colors. I did a lot of work cleaning up the scan too. Take a look. Another lovely wall by lastdino! I love the abstract effects you put in the wall. It looks very cool and realistic. Adding to favs! wow! the bg is so pretty! it has this effect that makes it look like a dreamXD the sun light is so pretty, shinning through the trees... great job! Woooooooooooooooow!!!! 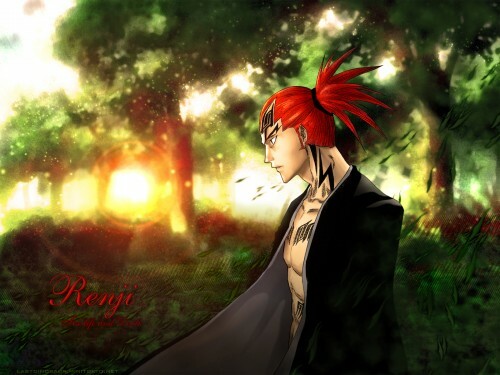 Renji is my favorite character of bleach XD . I love this wallpaper, it's wonderful!!! Congratulations LastDinosaur :) :nya:. i love aburai renji too, but i don't think this wall does him justice. the scan and background and lettering just don't mesh. i seems like renji's just standing in front of some surreal painting. no offense, but you've done better. much better. I'm not a very big fan of the scan you used...but I do like the background. As much of a pain as you can be, you've got a knack for making walls. XD Nice job on the background, Dino. ouhhh i like very much your wall! Very awesome bg you did for this wall, and it goes well with the scan. Very cool, keep it up! whoa i love the background its so colourful! how'd u do it?! the character fits in perfectly thanks for sharing! it's Renji-san! I love Abarai, such a nice chara.